The Radian is clearly aimed at the choosy, pack-loving traveler who eschews roller bags for aesthetic — which describes me to a tee. Strictly rolltop bags (originating in cyclist and outdoors circles) end up feeling restrictive in where you can stow gear, and rollers are boxy and unrefined. So the Radian takes a bit from both, with the added ability to add bits and pieces according to your needs. The core pack is quite streamlined, with no protruding external pockets whatsoever. There’s the main compartment — 42 liters, if you’re curious — and a cleverly hidden laptop compartment between the main one and the back pads. Both are independently lined with waterproof material (in addition to the water-resistant outer layer) and the zippers are similarly sealed. There’s also a mesh pouch hidden like the laptop area that you can pop out or stow at will. You can roll up the rolltop and secure it with Velcro, or treat it as a big flap and snap it to a strap attached to the bottom of the bag — the straps themselves are attached with strong Velcro, so you can take them off if you’re going roll style. The “Cobra” buckle upgrade is cool but the standard plastic buckles are well made enough that you shouldn’t feel any pressure to pay the $65 to upgrade. Access is where things begin to diverge. Unlike most rolltop packs, you can lay the bag on the ground and unzip the top as if it were a roller, letting you access the whole space from somewhere other than the top. The flap also has its own mesh enclosure. This is extremely handy and addresses the main ergonomic issue I’ve always had with strictly top-loading bags. In a further assimilation of rolltop qualities, there’s a secret pocket at the bottom of the bag that houses a large cloth cover that seals up the pack straps and so on, making the bag much more stowable and preventing TSA or baggage handlers from having to negotiate all that junk or bag it up themselves. Of course, a single large compartment is rarely enough when you’re doing real traveling and need to access this document or that gadget in a hurry. So the Radian joins the Mission Workshop Arkiv modular system, which lets you add on a variety of extra pockets of various sizes and types. Just be careful that you don’t push it over the carry-on size limit (though you can always stuff the extra pockets inside temporarily). There are six rails — two on each side and two on the back — and a handful of accessories that go on each, sliding on with sturdy metal clips. The pack I tested had two zippered side pockets, the “mini folio” and the “horizontal zip” on the back, plus a cell phone pocket for the front strap. There’s really no need to get the separate laptop case, since the laptop compartment would honestly fit two or three. It’s a great place to store dress shirts and other items that need to stay folded up and straight. As far as room, the 42 liters are enough on my estimation to pack for a five-day trip — that is to say, I easily fit in five pairs of socks and underwear, five t-shirts, a sweater or two, a dress shirt, some shorts and a pair of jeans. More than that would be kind of a stretch if you were also planning on bringing things like a camera, a book or two and all the other usual travel accessories. The main compartment has mesh areas on the side to isolate toiletries and so on, but they’re just divisions; they don’t add space. There are places for small things in the outside pockets but again, not a lot of room for much bigger than a paperback, water bottle or snack unless you spring for the folio add-on. As for looks — the version I tested was the black camo version, obviously, which looks a little more subdued in real life than my poorly color-balanced pictures make it look. Personally I prefer the company’s flat grey over the camo and the black. Makes it even more low-profile. 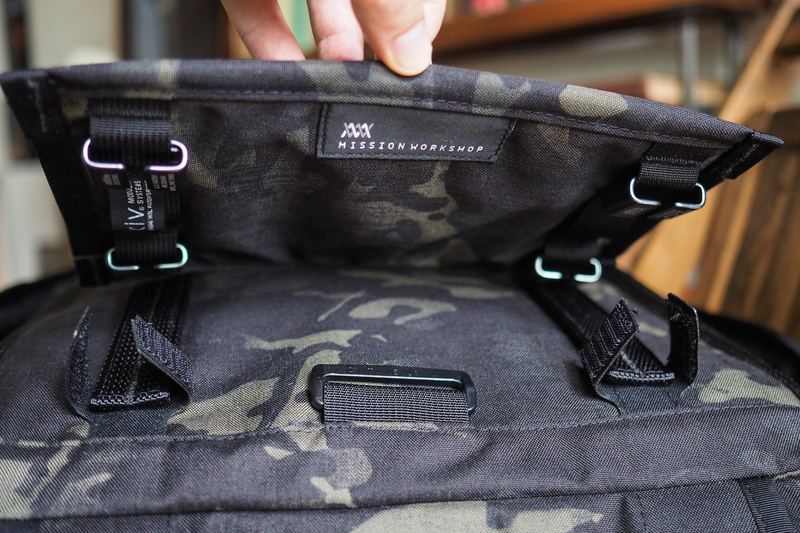 In the end I think the Radian is the best option for anyone looking at Mission Workshop bags who wants a modular option, but unless you plan on swapping out pieces a lot, I’m not personally convinced that it’s better than their all-in-one bags like the Rambler and Vandal. By all means take a look at putting a Radian system together, but don’t neglect to check if any of the pre-built ones fit your needs as well.